That’s the NFL distribution match for this Sunday’s late (4:15pm EST) FOX game (courtesy of the506.com). 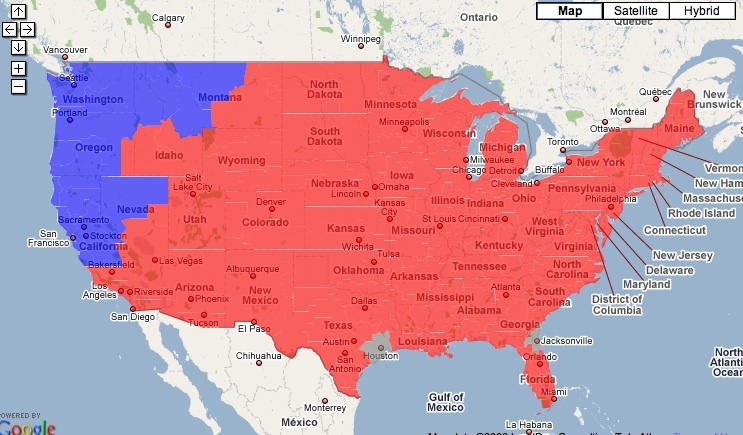 Blue is Seattle @ San Francisco and red is NY Giants @ Pittsburgh. Regardless of other affiliations, I think we can all safely say that we all want to be in red states for this one. There were at least two noteworthy David Lawrences: David H. Lawrence, the English writer of Sons and Lovers among other things–probably the better known of the two–and David L. Lawrence, the Pennsylvania Governor and Pittsburgh Mayor, for whom the convention center is named. Next time you’ll know that D.L. didn’t write Sons and Lovers and D.H. didn’t govern Pittsburgh. I spent lunch time walking around Chinatown yesterday. It was really reminiscent of a Taipei in some ways, hills and many white tourists notwithstanding. It’s strange what what one misses about a place.